Sikkim Chief Minister Pawan Chamling inaugurated the three-day Namchi Mahotsav at Central Park in Namchi on Sunday. This year the Namchi Mahotsav is held with the theme of ‘explore ethnic beauty’, that promises to showcase collection of Sikkimese culture, tradition, food, entertainment and various activities. Addressing the gathering at the inaugural function, the State Chief Minister said that Namchi Mahotsav showcases culture, tradition and food of Sikkim and also represents people of Namchi across the world. “The celebration should be extended from three days to one month so that the festival can be connected with tourism of Namchi and people of Namchi will be benefitted in the long run,” he said. 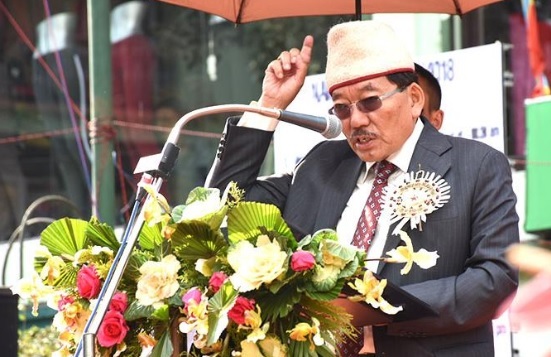 He also said that Sikkim has become a model state of the country due to the collective work of the people and his government and now ‘we strive to make Sikkim the best place to live in the world. He further added that some outside forces with nefarious designs are working in Sikkim with caste and religious propaganda. He appealed people to stay alert and respond to them with the developmental works done by the Sikkim government. The inaugural function was also graced by Sikkim Assembly Speaker K N Rai, State Tourism Minister Ugen T Gyatso Bhutia, ministers, MLAs, chairpersons and officials from various departments. Traditional dances of different ethnic groups of Sikkim followed by dance performance by BRSTP dance crew and Step Dance Academy Namchi were performed during the cultural show in the evening. It was followed by a musical concert from contestants of Himali Prativa Ko Khoj season II with Madhurima band of Darjeeling.